As you all know I am a big fan of rompers, and I am completely loving this Valley Girl Romper from Tobi.com! It's both feminine and flirty with the cute ruffle detail and the deeper neckline. It's also super lightweight, which makes it perfect for the summer. You can easily dress it up, like I have here, or down with flat sandals and stud earrings. The only thing I want to warn you about is that the romper does run small, I'm wearing a medium here and would have been better off with the large because of my longer torso. If you haven't shopped at Tobi before you have to check out their website. They have the cutest clothes at really great prices - the romper I'm wearing here is only $50! Tobi has tons of super on trend pieces and carries everything from dresses to bodysuits shoes to accessories and more! This was my first time shopping with them and I was very pleased with my items. I'm sad that I started shopping with them after I graduated college because their clothes would be perfect for different school functions. For all my sorority girls I recommend checking out their bodycon dresses, cocktail dresses, and party dresses for your next date party, cocktail event, or formal! I know that now when I have an event I will be definitely be looking to Tobi for an outfit. Sidenote: I had to include the last picture because Coco was being too cute and I loved the shot! 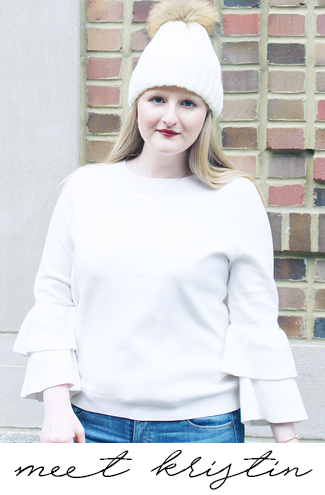 Today I'm linking up with Thursday Fashion Files, #WIWT, Spotlight, Thoughts for Thursday, What I Wore to Work, and Throwback Thursday. This romper is SO cute! Love the light blue, such a gorgeous color for summer! I love the light blue color on you! Rompers are the best! I am obsessed with this romper on you! Absolutely gorgeous, sweet girl. I wish I had your flawless porcelain skin! Love the pretty details on the romper.